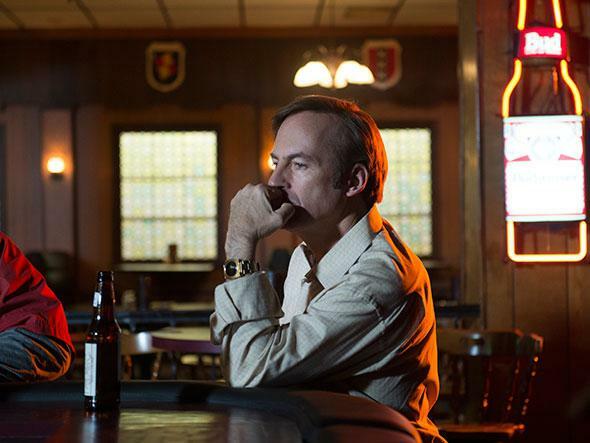 Better Call Saul finale review: The show’s first season insisted that it’s never possible to escape your past. Better Call Saul’s smart, surprising first season insisted that it’s never possible to escape your past. Jimmy McGill, or Slippin’ Jimmy? Perhaps it shouldn’t come as a surprise that a spinoff—a program that gives viewers a second chance to spend time with familiar characters—would adopt second chances as its central theme. But who would’ve guessed that such a show would conclude that attempts at reinvention are hopeless, pointless, and utterly doomed? When Better Call Saul ended its first season Monday night, that was its final takeaway: No matter how much a man tries to rehabilitate himself, no matter the qualifications he gains or the hard work he puts in, he cannot escape his past. It’s a little depressing, but it was a surprise, and surprise is the most difficult emotion for a prequel to generate. I confess that I came to Better Call Saul with a duffle bag full of reservations: In Breaking Bad, Bob Odenkirk’s Saul Goodman provided an essential service—he was a mentor to Walter White and Jesse Pinkman, a menschy enabler of criminality. He was also a source of comic relief on a show that was as serious as lung cancer. I just wasn’t sure his shoulders were sturdy enough to carry the weight of an entire series. Then there was the question of genre. At first, the spinoff was announced as a comedy; later it seemed it would be a procedural. In the end, it turned out to be a tragedy. With the possible exception of Mad Men’s Joan Holloway, no recent TV character has stung my heart more than Jimmy McGill. Jimmy’s first words on Better Call Saul—after the premiere’s flash-forward cold open showed how Saul Goodman had fled Albuquerque and become Gene, an anxious Omaha Cinnabon manager—were about the unformed state of the adolescent mind. “Your brain, it’s just not all there yet. If we were held responsible for what we did when we were 19 … ” he said, desperately trying to win clemency for three young knuckleheads who’d done unspeakable things to a corpse. That particular case was hopeless, but the question of whether it’s possible to rewind the VHS tape of life and erase one’s youthful mistakes became the overarching theme of the first season. When McGill abandoned his nom de crime, Slippin’ Jimmy, and his life of delinquency in Cicero, Illinois, to start over in Albuquerque, New Mexico, he seemed determined to succeed. He showed impressive initiative, finishing his undergraduate work at a local community college, acquiring a law degree from the University of American Samoa, and persisting until he passed the New Mexico bar—all while cheerfully toiling in the mail room of his brother’s snooty law firm. Nevertheless, he couldn’t escape his history. A brilliant criminal mind is a terrible thing to waste, and Jimmy’s kept placing him in the path of temptation. He knew where a dumb embezzler would hide his stash and how a small-time scam artist would operate, and it would have been easy for him to con those con men, but Jimmy resisted until the very end of the season. He promised his brother Chuck that he would “keep plugging and do good work” until the clients came. He worked senior center bingo games and accosted mall-walking old folks to build his fledgling elderlaw practice. But all that slog was for naught, because he could never shake his youthful misdeeds. When Jimmy discovered in Episode 9 that Chuck was blackballing him from HHM—the fancy law firm at which he was a name partner—despite the fact that Jimmy had brought a blockbuster class-action suit to the firm, the wind went out of his sails. “People don’t change,” Chuck told him. “I know who you are. You’re Slippin’ Jimmy. Slippin’ Jimmy I can handle. But Slippin’ Jimmy with a law degree is like a chimp with a machine gun.” Several listeners to the weekly Better Call Saul TV Club podcast Seth Stevenson and I hosted wrote in to say that while Chuck’s personal interactions with his brother had been awful, professionally he had acted quite reasonably: Most reputable law firms would reject someone with Jimmy’s credentials and record of ethical lapses. When Jimmy returned to his Illinois grifting grounds in the finale and pulled a few cons with his old friend Marco, his choice became clear: He could carry on scamming for thrills and bills, or he could head back to Albuquerque, write wills for needy seniors, and live in a tiny room behind a nail salon. It seemed like he’d chosen the unprofitable path of righteousness until he noticed the ring Marco had left him, and was reminded that he would never be allowed to escape his past. Anyone who’s seen Breaking Bad already knew which option Jimmy would take, but after what turned out to be a surprisingly rich, emotionally complex first season, I’m eager to see the next part of Jimmy’s journey to Saul.